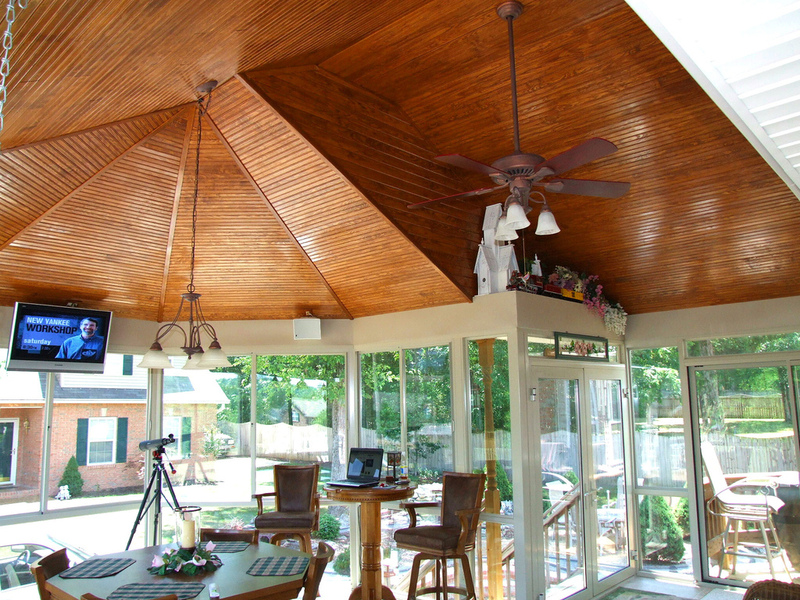 Sunroom installation requires little to no heavy renovation work. It simply uses some outdoor space you already have and transforms it into a beautiful extra space indoors. A sunroom is a place for relaxation when the sun is shining and a protected space for daily activities in unpleasant weather conditions. A sunroom can be located in any outdoor space where there is light and some sunshine. If you want maximum exposure to the sun, the ideal location for sunroom installation would be facing south, it can be an entirely separate room or extra space off an existing room. Even an alcove or big bay window can be transformed into a sunroom. Having direct access from a sunroom to an outdoor area is not necessary, but this will add to the outdoor feel of the new indoor space. 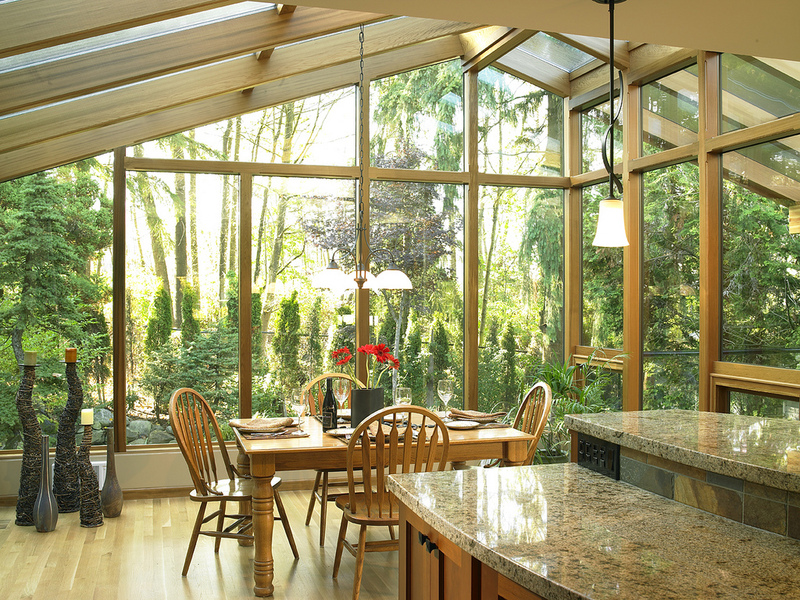 Actually light is the most important factor when creating a sunroom. The amount of light it can get, and the quality of that light will influence sunroom design heavily. Anywhere that gets at least four hours of sunshine on a bright day in winter is suitable, and the quality of light will help you to decide how to decorate it to give it that indoor-outdoor feel. Too much sunlight can cause a room to become too bright for comfort. Light can be controlled by installing adjustable blinds, curtains made from see-through fabric or roller-shades made from natural fibers. Any type of shade that limits the glare from direct sunshine will be suitable. For maximum sunlight you can leave the windows either undressed, or simply dress them with fabric valances. If you fit lined drapes or louvered shutters, these can make a sunroom feel more cosy and comfortable on dull days or at night when you can keep them drawn shut or closed. If your sunroom design includes a skylight, you will also need to consider a suitable type of fabric, shade or window blind that will allow the amount of light to be controlled. It is necessary to avoid overheating in a sunroom when the light is bright and to conserve heat when the temperature drops. The temperature can change very rapidly in a sunroom, because it has bigger windows and more exposure to the sun than any other room in the house. You can choose to install a heat-retaining stone or brick floor, or choose tiles for your sunroom floor covering. Walls and window sills can be matched to the hard flooring of your choice. These materials are all good for storing the sun’s energy and releasing heat after the sun has gone down. Another method for keeping in the heat is to use tables that are topped with tiles, a selection of earthenware pots and accessories or pottery plant holders. Rugs and throws made from natural wool will also help to keep out the chill. Windows with double glazing will stop drafts and can be opened in warm weather to allow a cooler breeze to enter. Alternatively, on hot sultry days you may need additional ventilation from a ceiling fan. Inside the sunroom you can create a relaxing atmosphere through your choice of colors. Strong colors are best avoided, as pure white or black will interfere with the heating and cooling processes. Natural earthtones are more appropriate and can be used to match the scene outside the sunroom. Generally if your sunroom overlooks a lawn and flower beds, you can add include some green and other natural colors in the decor. Brown and greens are effective where there are trees in the view. A lake or sea views, or any water feature, can be enhanced with a light blue. The type of furniture you choose for a sunroom can increase the sense of being outdoors. Natural materials work best, so you could choose bamboo or rattan furniture or use furnishings made from natural wood and natural fibres. Plants add an outdoor feel to a sunroom. You could feature a superb ceramic plant stand, or use attractive window boxes to grow attractive plants indoors. The style is up to you. It can be funky or comfortable, traditional, contemporary or shabby chic. A sunroom is an ideal place to display handmade items and any handicrafts you have collected on your travels. The best look to aim for in sunroom design is a comfortable and relaxed outdoor style. Keep it casual and avoid making it look like an indoor room where everything has to match. Alternatively, if you find the idea of constructing a sunroom tiring or difficult, please be sure to contact us here at eHardhat to have our nationwide network of sunroom construction experts lend their expertise.